The Mystical Amulet Believed to Increase Your Luck in Lotteries, at the Gaming Tables, and in Life! Since the times of Ancient Judea, King David’s Helping Hand has been sought after by professional gamblers throughout the world. 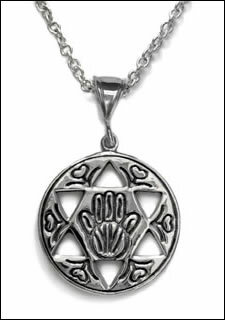 Today, this lucky charm amulet, King David’s Helping Hand, is a valued possession by those who dare to test their wits and skills in card games, bingo, lotteries, in the casinos or in any game of chance. Whatever your need, whether it is to increase your chances of success in gambling or in a relationship that needs to be fixed, King David’s Helping Hand is ready to reach out to you. Made of highly polished sterling silver, this legendary lucky charm amulet comes with a beautiful silver chain. About six months ago a received a bill in the mail for $18,000 that lets just say was the result of someone trying to cheat me out of money. I was already in debt, collections was harassing me, and with my current job I could only afford to pay rent and just get food. Things were just going downhill from there. I have ordered from you before and have had great results also I have read some very positive testimonials so I decided to save what I could and try. I got a Samadhi, King David’s Helping Hand and a Guardian Angel and started to feel much better emotionally. Other things in life stared to get better. I am getting a premotion at work. I’m making more money, getting lots of hours, my debt is nearly paid off, and paper work that was lost on the $18,000 was actually found by the company and now they are going after the person who actually owes it. Though it’s not over yet, it’s way better! I received an extra pay cheque this month, my GST cheque , and I actually have money in my account. For the first time in years I cried tears of happiness! Once I’m “out of the water” I can start ordering for my friends! Thank you!!! The impossible has happened!